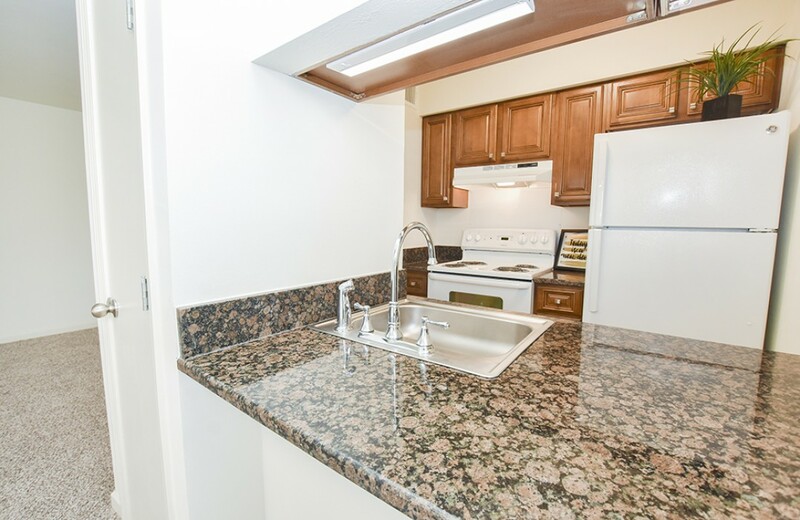 SPECIAL: Save up to $150 on your deposit for a renovated 1 or 2 bedroom - granite countertops, updated cabinetry, and more! 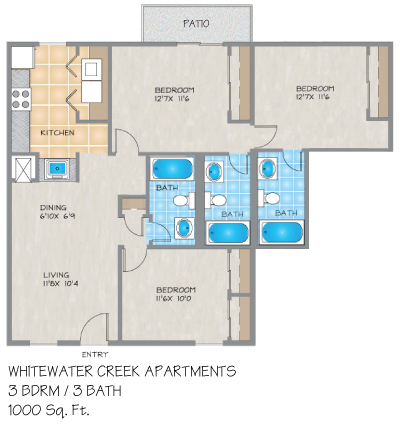 Please send me more information about White Water Creek Apartments. 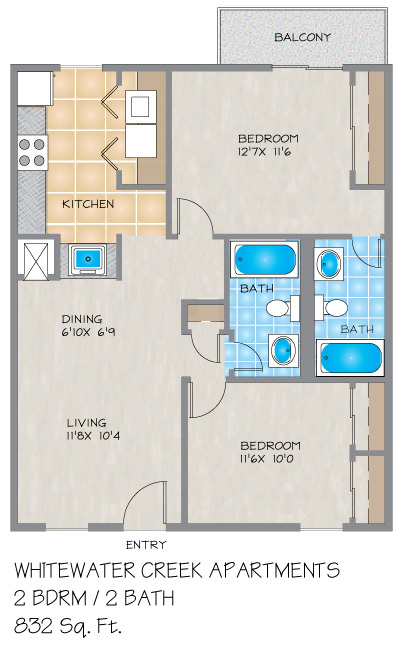 Our spacious one and two bedroom apartment homes combine comfort with convenience. 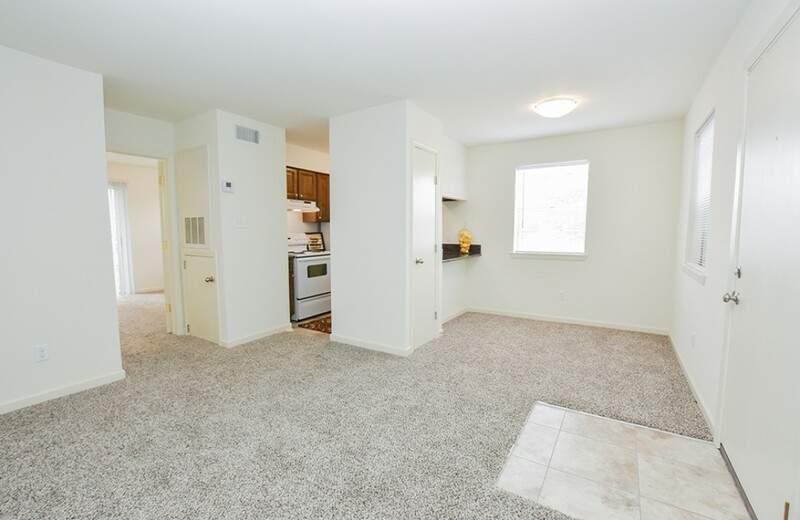 At White Water Creek every apartment comes standard with plush carpeting, full size washer/dryer, a fully equipped kitchen with self-cleaning oven and a private patio or balcony. Select apartments offer vaulted ceilings and skylights. Your living experience will be heightened by access gates, free off street parking close to your door and park like surroundings. Our winding walkways, bubbling creeks, and flowing fountains will welcome you home. Our sparkling swimming pool is situated among majestic palm-trees and lush landscaping. You'll be elated with your apartment home and the path you travel to it. White Water Creek Apartments are located on Veterans Boulevard, providing convenience to Interstate-10, New Orleans area universities, many local restaurants, several shopping malls, and more. We are within walking distance of Lafreniere Park where you can enjoy a jogging path, a lake, a playground, recreational ball and various other regular and seasonal activities. INQUIRE ABOUT FURNISHED CORPORATE APARTMENTS! 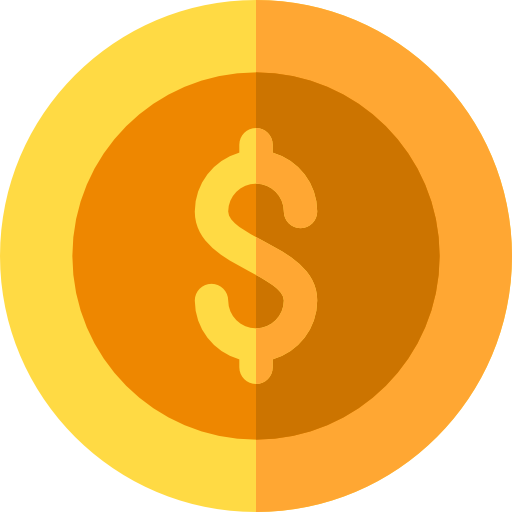 2 Pets (Maximum total weight, of both pets combined, 40 pounds full grown): $600 deposit of which $100 is non-refundable, plus $25/month pet fee. Great location since it’s close to everything around you. Great management and excellent maintenance here. I totally recommend this place. Best place ever!!! The property itself is very clean and peaceful. The community is so welcoming. And everyone on the staff is super helpful. White Water Creek is a great place to live! My husband and I have been living here for 4 months. Outside is beautiful. The staff is courteous and maintenance responds quickly and usually the leasing agents follow up after every work order to see if the job was done satisfactorily. What I do not appreciate are the thin walls and the outdated construction. Our neighbors smoke around the clock and even with our windows and doors closed, all the second hand smoke seeps into our apartment and we should not have to be inhaling that against our will. We hear when they are talking on their phones at odd hours on their porch or at their front door and sometimes this prevents us from sleeping at night. The air conditioning units on top of the building are extremely loud and disturbing. We have complained about it but it doesn't seem anything can be done about that. Outside of these things, we appreciate living here. They are very polite and courteous. When a problem arises they are prompt. We are very happy. Management has always been friendly and polite and responsive to any issues I've had. This is my first time living an Apt. The staff and personnel ar White Water Creek Apts. have always been very helpful, friendly, and professional. The maintenance staff are friendly, helpful and knowledeable with all types of maintenance up keep. The grounds and Apts. Are always meticulously kept. It has been a very nice experience. Thank you. I give it 5 ?????????? Management and maintenance team is excellent. This review is for September 2016, White Water Creek Apartments, on Veterans. This review is about the amazing customer service my family received from Nick S. It is not about the living conditions or Apartment itself. We haven't lived here long enough. I hate doing reviews but sometimes you get exceptional service and they need to be rewarded. We shopped at over 7 Apartment complexes and it was just one disappointment after another. Just a soul sucking process with ... See More limited time. The worst was the service of the salespeople. Most of those places acted like a DMV line just pumping out income questions like you were moving in next day. Lady, I just asked for a 10 minute tour. I don't need a 30 minute life background check just to look at mediocre living arrangements. It was such a turn off. My decision is based 65% on price. The other 35% is based on the Office salesperson because I will be dealing with you for years to come. I'll see you more than my own family. If you're rude or coming off as condescending or insincere, I'll walk away. You shouldn't even intensely screen me before the tour like that. Take the ID and let's go. One girl at another place made us feel like hobo's who could never afford to live there. I believe I knew my price range before just showing up to play house. Anyways, back to this amazing customer service that helped my decision to sign the lease here. The person that helped us and gave the tour was Nick @ White Water Creek. He came off as sincere and up front. He didn't ask us a million questions and since we've been to over 7 Apartment complexes it was getting monotonous with the same old "Are you suuurrree you can live here?," speel. He got straight to the point. Showed us the Apt. No up selling and fake pleasantries. He told us what we would and wouldn't get. It felt genuine and real. Then during the paperwork part of it. He was very patient and helpful. He understood our fears and knew how nerve recking the waiting can be so he called and kept us informed. The entire process was very friendly and helpful. Nick made us very comfortable and everything seemed to fall into place. This was where we wanted to make our Home. His other office mate, a pretty female, sorry I didn't catch her name, was also very sweet and professional. I feel I would have no hassle doing business here and welcome the opportunity. Thank you, Nick. We appreciate your help and the help of your Office. Great Office Team. Super Sweet. This review is for September 2016, White Water Creek Apartments, on Veterans. This review is about the amazing customer service my family received from Nick. It is not about the living conditions or Apartment itself. We haven't lived here long enough. I hate doing reviews but sometimes you get exceptional service and they need to be rewarded. We shopped at over 7 Apartment complexes and it was just one disappointment after another. Just a soul sucking process with limited time. The worst was the service of the salespeople. Most of those places acted like a DMV line just pumping out income questions like you were moving in next day. Lady, I just asked for a 10 minute tour. I don't need a 30 minute life background check just to look at mediocre living arrangements. It was such a turn off. My decision is based 65% on price. The other 35% is based on the Office salesperson because I will be dealing with you for years to come. I'll see you more than my own family. If you're rude or coming off as condescending or insincere, I'll walk away. You shouldn't even intensely screen me before the tour like that. Take the ID and let's go. One girl at another place made us feel like hobo's who could never afford to live there. I believe I knew my price range before just showing up to play house. Anyways, back to this amazing customer service that helped my decision to sign the lease here. The person that helped us and gave the tour was Nick @ White Water Creek. He came off as sincere and up front. He didn't ask us a million questions and since we've been to over 7 Apartment complexes it was getting monotonous with the same old "Are you suuurrree you can live here?," speel. He got straight to the point. Showed us the Apt. No up selling and fake pleasantries. He told us what we would and wouldn't get. It felt genuine and real. Then during the paperwork part of it. He was very patient and helpful. He understood our fears and knew how nerve recking the waiting can be so he called and kept us informed. The entire process was very friendly and helpful. Nick made us very comfortable and everything seemed to fall into place. This was where we wanted to make our Home. His other office mate, a pretty female, sorry I didn't catch her name, was also very sweet and professional. I feel I would have no hassle doing business here and welcome the opportunity. Thank you, Nick. We appreciate your help and the help of your Office. This review is for September 2016, White Water Creek Apartments, on Veterans. This review is about the amazing customer service my family received from Nick Scott. It is not about the living conditions or Apartment itself. We haven't lived here long enough. I hate doing reviews but sometimes you get exceptional service and they need to be rewarded. We shopped at over 7 Apartment complexes and it was just one disappointment after another. Just a soul sucking process with limited time. The worst was the service of the salespeople. Most of those places acted like a DMV line just pumping out income questions like you were moving in next day. Lady, I just asked for a 10 minute tour. I don't need a 30 minute life background check just to look at mediocre living arrangements. It was such a turn off. My decision is based 65% on price. The other 35% is based on the Office salesperson because I will be dealing with you for years to come. I'll see you more than my own family. If you're rude or coming off as condescending or insincere, I'll walk away. You shouldn't even intensely screen me before the tour like that. Take the ID and let's go. One girl at another place made us feel like hobo's who could never afford to live there. I believe I knew my price range before just showing up to play house. Anyways, back to this amazing customer service that helped my decision to sign the lease here. The person that helped us and gave the tour was Nick Scott @ White Water Creek. He came off as sincere and up front. He didn't ask us a million questions and since we've been to over 7 Apartment complexes it was getting monotonous with the same old "Are you suuurrree you can live here?," speel. He got straight to the point. Showed us the Apt. No up selling and fake pleasantries. He told us what we would and wouldn't get. It felt genuine and real. Then during the paperwork part of it. He was very patient and helpful. He understood our fears and knew how nerve recking the waiting can be so he called and kept us informed. The entire process was very friendly and helpful. Nick made us very comfortable and everything seemed to fall into place. This was where we wanted to make our Home. His other office mate, a pretty female, sorry I didn't catch her name, was also very sweet and professional. I feel I would have no hassle doing business here and welcome the opportunity. Thank you, Nick. We appreciate your help and the help of your Office. This review is for September 2016, White Water Creek Apartments, on Veterans. This review is about the amazing customer service my family received from Nick Scott. It is not about the living conditions or Apartment itself. We haven't lived here long enough. I hate doing reviews but sometimes you get exceptional service and they need to be rewarded. We shopped at over 7 Apartment complexes and it was just one disappointment after another. Just a soul sucking process with limited time. The worst was the service of the salespeople. Most of those places acted like a DMV line just pumping out income questions like you were moving in next day. Lady, I just asked for a 10 minute tour. I don't need a 30 minute life background check just to look at mediocre living arrangements. It was such a turn off. My decision is based 65% on price. The other 35% is based on the Office salesperson because I will be dealing with you for years to come. I'll see you more than my own family. If you're rude or coming off as condescending or insincere, I'll walk away. You shouldn't even intensely screen me before the tour like that. Take the ID and let's go. One girl at another place made us feel like hobo's who could never afford to live there. I believe I knew my price range before just showing up to play house. Anyways, back to this amazing customer service that helped my decision to sign the lease here. The person that helped us and gave the tour was Nick Scott @ White Water Creek. He came off as sincere and up front. He didn't ask us a million questions and since we've been to over 7 Apartment complexes it was getting monotonous with the same old "Are you suuurrree you can live here?," speel. He got straight to the point. Showed us the Apt. No up selling and fake pleasantries. He told us what we would and wouldn't get. It felt genuine and real. Then during the paperwork part of it. He was very patient and helpful. He understood our fears and knew how nerve wrecking the waiting can be so he called and kept us informed. The entire process was very friendly and helpful. Nick made us very comfortable and everything seemed to fall into place. This was where we wanted to make our Home. His other office mate, a pretty female, sorry I didn't catch her name, was also very sweet and professional. I feel I would have no hassle doing business here and welcome the opportunity. Thank you, Nick. We appreciate your help and the help of your Office.